England’s schools are drowning in data. Everybody is obsessed with accountability statistics, from Ofsted down to the school cat. This obsession with data distorts the way we look at pupils and their education. 300 spreadsheet columns running from A to KD are produced for every primary school in every local authority. Every child has a cumulative data record from starting to leaving school. These numbers forms the basis for Ofsted judgements, school takeover bids and parents’ choice of school. And it’s next to useless. The system claims to make fair judgements about how ‘effective’ each school is, after making allowances for ‘disadvantage’. This is based on the proportion of pupils in a school who have been entitled to free school meals (FSM) at some time in the past six years, known as FSMever6. It is true that even a short spell on FSM tends to reduce attainment, but the data makes no distinction between the length or the severity of child poverty. The disadvantage / FSMever6 category is misleading because it doesn’t differentiate between temporary hardship and chronic poverty. Analysis of national data shows that any length of time in poverty is damaging, but there are substantial differences between a brief period and chronic poverty. 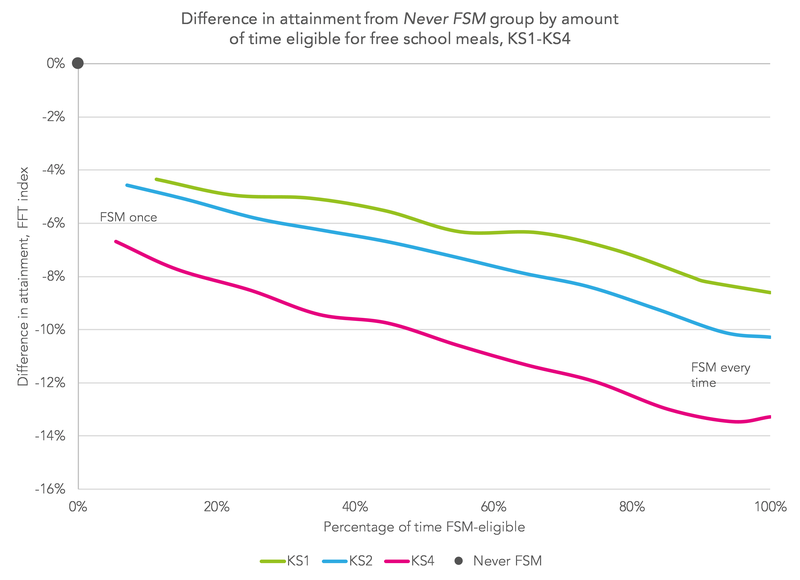 On average across England children who have been entitled to FSM in just one term of primary school score about 4 percentage points below the average at KS2, but those who have been FSM for six full years are over 10 percentage points down. The impact during secondary school is worse: from around 6 to 13 percentage points at GCSE. One indicator of long-lasting poverty is if more of the pupils classed as disadvantaged are currently entitled to free meals. Nationally around half of children classed as Disadvantaged have a current entitlement, but in some places it is as high as two thirds, for example Middlesbrough and Knowsley, which suggests that more families are trapped in chronic poverty there. In some other areas such as Harrogate or Winchester, only a third of children classed as disadvantaged are currently FSM-entitled, suggesting better opportunities and a faster escape from poverty. As well as the physical effects, being trapped in chronic poverty has a deep psychological effect, leading to depression and despair. This often impacts on children’s mental health and attitudes to learning. Children with a current FSM entitlement are only two-thirds as likely to reach the ‘expected standard’ in reading, writing and mathematics. Things get worse as time goes on: they are less than half as likely to achieve grade 5 or above in English and maths at GCSE. This is not the only distortion. There are degrees of poverty, and many children are in desperate situations. It is no wonder that some areas have been near the bottom of school league tables for years. By themselves neither disadvantage, nor even current FSM figures, can reflect the extent of some children’s misery. Free School Meal entitlement is a ‘proxy indicator’ of poverty, used because the data is easy to collect. It cannot reflect whether children are sleeping in damp rooms, not eating properly, and don’t have winter clothes. It doesn’t show that some parents have become deeply depressed or addicted to drugs. It doesn’t show the demoralising effect of living in a deindustrialised town with no job prospects – in some cases for 30 years or more. This complexity is better reflected in other social data, such as the Index of Multiple Deprivation, available on a geographical basis. There is no such thing as a ‘normal’ FSM pupil. There is also no ‘standard’ non-FSM child. We cannot assume that children who are not FSM-entitled aren’t affected by poverty. Many are in poverty but do not match the criteria. It is nonsense to compare two schools just because they both have 70% of non-FSM children. In some schools most of the families are struggling to make ends meet; in others there are many families with affluent lifestyles and the means to boost their children’s school performance. This entry was posted in Social Justice, Uncategorized and tagged accountability pressures, disadvantage, poverty, testing. Bookmark the permalink.